How Old Will a Black Walnut Tree Be Before it Produces Nuts? Do Deer Like the Leaves of Black Walnut Trees? The Juglans nigra, commonly known as the Black Walnut tree, is native to the eastern half of the United States. Though grown primarily as a shade tree, its other uses make it one of the most valuable native trees. A large tree with a rounded crown, the Black Walnut has deeply grooved and brownish-black bark. Between nine and 23 serrated leaflets make up each leaf. Dark green leaves turn yellow in the fall. The tree often spreads through squirrels burying the nuts. Black Walnut requires sunny locations with rich, moist but well-drained soil. The tree reaches heights of 70 to 90 feet with a 70-foot spread. The trunk diameter grows up to 4 feet. Small, light green flowers appear in early spring. An individual tree produces both male and female flowers. Prized for its hardwood, the black walnut is used for furniture, gunstock and veneers. The tree provides nutritious edible nuts with husks that have value as a dye. Black Walnut produces a known toxin, juglone, which affects sensitive plants, such as tomato, asparagus, apple, lilac, rhododendron and blueberry. Locate gardens away from the tree and don’t use any parts for mulch. Black walnut (Juglans nigra) trees are hardy throughout Texas. 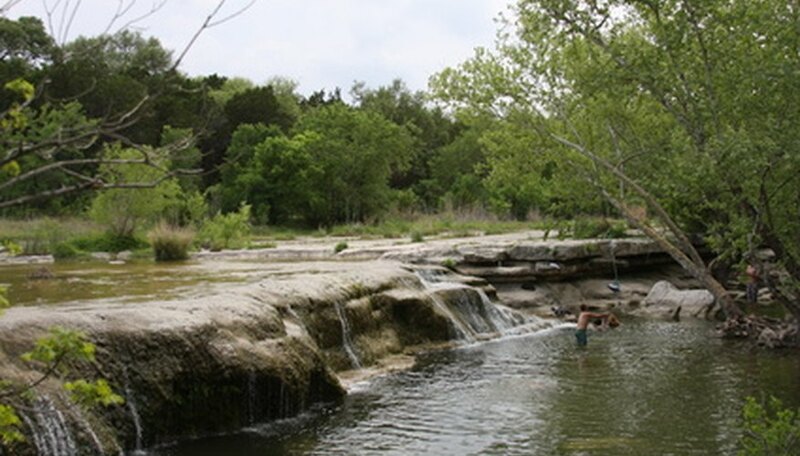 They thrive in locations with fertile, moist, alkaline limestone-based soil like that of state's eastern, central and north central floodplains and stream banks. Black walnuts need full sun and an average rainfall of 3 inches per month. Add about a pound of black walnut shells, also called husks, to a food processor. Process the husks on the processor's highest setting. Do this for about 2 minutes straight. Pour the grated husks onto a cookie sheet. Bake the powdered husks at 400 degrees Fahrenheit for about 25 minutes. Allow the black walnut powder time to cool to room temperature, and then bottle it for future use. Japanese maples (Acer palmatum) reach 25 feet in both height and width and have bright red leaves in the spring that turn green in summer and orange in autumn. They perform best in dappled sun to light shade and can becomes scorched if given too much sun. Japanese maples are hardy in USDA zones 5 to 8. Eastern redbud (Cercis canadensis) bears large, heart-shaped, bright green leaves. Its blossoms are deep pink (and occasionally white) rather than red. When the blossoms fall, the trees develop elongated green seed pods. Eastern redbuds can reach 30 feet high and often develop sprawling branches. The Canadian hemlock (Tsuga canadensis) can reach 80 feet in height in the wild, but averages 25 feet in urban settings. The trees have small cones and tiny dark green needles. This member of the pine family can grow in full sun to full shade but can be picky. Canadian hemlocks do not fare well in poor-draining or sandy soils and are sensitive to drought and heat. Southern catalpa (Catalpa bignoniodes) is hardy in zones 5 to 9 and tolerant of a wide range of both soil conditions and light. The trees can reach 40 feet high and 25 feet wide. Southern catalpas develop white flowers that are flecked with yellow and purple spots. 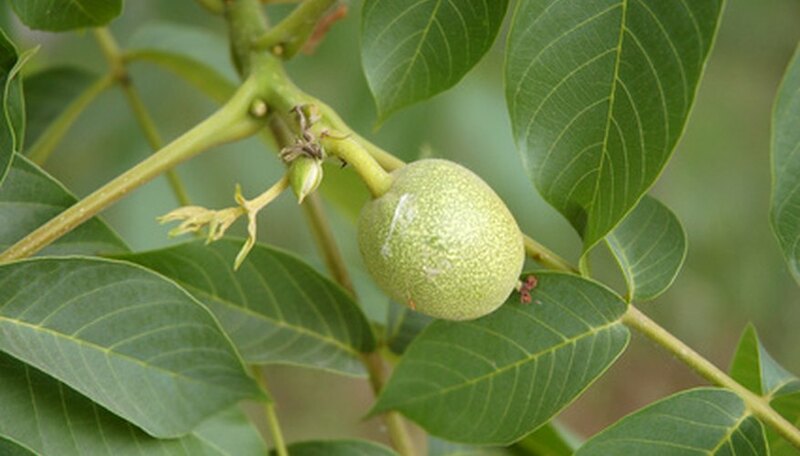 Black walnut trees begin nut production at approximately 10 years old. The best nut production occurs after the tree ages past 30 years. Production increases with more sunlight, but can be sporadic. Expect good nut production in 2 of every 5 years the tree produces. Black walnut is native to the central and eastern U.S., but the tree will grow anywhere it receives at least 140 days free of frost and 25 inches of precipitation each year. Black walnuts can grow up to 100 feet tall, and specimens have been recorded as having a trunk diameter of 4 feet and obtaining an age of more than 200 years. Black walnut trees need full sun, and they prefer a rich and moist but well-draining soil that has a depth of at least 30 feet to allow for proper root growth. In addition to harvesting and eating the nuts, black walnut wood is used for sheets of veneer, decorative furniture and gun stocks. In some landscape situations, it can be used as a shade tree. Black walnuts produce a substance known as juglone that may be toxic to plants growing within 50 to 60 feet of the tree. 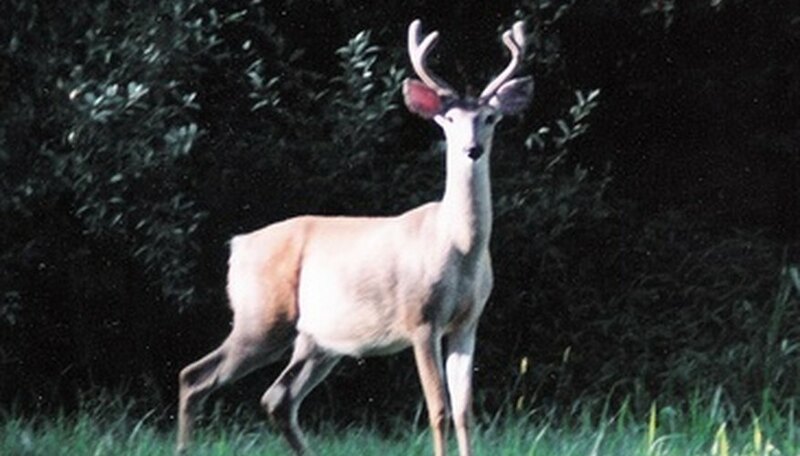 Deer do enjoy eating the leaves of black walnut trees. During the summer, deer regularly browse on these trees. In the winter, they will also eat small branches and new shoots from the trees. This does not normally cause permanent damage, but may make it necessary to increase normal tree pruning. Wear gloves, old shoes (or rubber shoes) and old clothes. Black walnuts will stain your clothes, shoes and hands. You can also use tongs to harvest black walnuts. Wait three months from the time the walnuts appear until you pick them. This usually occurs sometime from July to September. The nuts will be about 1 to 1 ½ inches in diameter when ripe. Pick the ripe black walnuts and place them in a bucket. You can even pick them right off the ground, which is the easiest way to harvest those nuts you cannot reach. Alternatively, you could use a ladder, but use common sense and proper safety measures. Harvest your nuts weekly for the next four to six weeks. The nuts during this time will continually drop and grow larger in size (1 to 1 ½ inches).